Manusia mesti bersatu, jangan jadi racist kerana kalau kita diserang UFO tapi tak bersatu mcmana nk pertahankan bumi? 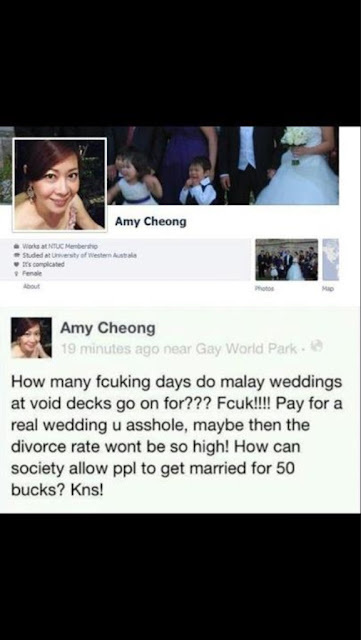 #RacistAmy Malang yang menimpa Amy kerana membahan majlis perkahwinan Melayu di perkarangan bahagian bawah apartmen. Jika anda berjumpa dengan Amy, berilah angpow kepadanya supaya dia boleh membantu majlis perkahwinan Melayu dengan cuma $50 Dollar Singapore sahaja. Yes, dia dok Singapore. Hello. We realize this content may be very upsetting, but we also highly value freedom of expression and freedom of speech. Sometimes content posted by a blogger may be mean-spirited or upsetting but does not violate the law. In order to maintain freedom of expression, we cannot remove that material. The kids who suggested this blog as containing a hateful material might be confusing himself between of what would be 'a blog that promoting hate' and 'a blog that gets all the hate for telling the truth because the fact that majority disliking what you aim for'. You can and should and always stop viewing content from this blog that deemed to offending you. You can block this blog from your computer. This prevents you from seeing content from this blog on your computer and prevents this mortal blogger from sending you messages via blogship, twitter et al, i mean, damn, i never had time to tell a message. Tell that to messenger. Spank you for taking the time to share your concern with us.